Over the last few years, I’ve been using a seasonal map to organise my yoga teaching. Until I witnessed myself gesturing the same way when I referenced the calendar year, I didn’t realize that I had an innate sense of time being egg-shaped instead of linear. For some reason I’ve always seen winter at the narrow top of the egg, summer at the wider bottom and spring and autumn on the longer sides. Growing up in the four seasons of the northern hemisphere on the northeast coast of the US meant that snowy winters felt steep and dark, and yet also like the peak or the turning point before the breaking open of spring. Being a mover from a very young age, winter snowfall meant cross-country skiing, snowballs and snow angels, and hanging out among the brave skeletal trees bowed down with ice. With the thaw of February came the smell of the earth again, instead of the clean crystalline smell of snow and pine. Cross-country running got me out, lungs burning, in the brisk and rainy air of spring. Plants and animals emerge from within and begin, with the increasing sun and rain, to expand outwards. This was the season I was born into. Summer was wide with our nearly three month school holidays and meant the garden was overflowing with edible and aromatic abundance. Swimming naked in cold mountain streams and the deep, deep lake we lived near. More running, cycling and lots of laying about in the sun and the shade of full bright green trees. Though born in spring, autumn was my favourite season. It meant school again, which I loved, and more running. But more than that, the turning of the leaves and the colors shifting to yellow, orange, red and brown. Raking leaves into huge piles and jumping into them, coming out with twigs through my hair and the smell of drying maple and oak leaves in my skin. This all made sense to me – a cycle from existence hovering in the dark, waiting to be born; the birthing in spring; the effulgence in summer; and the deepening and gathering inwards of autumn; then back to the full pulling inwards into the dark in winter. And around again. I can still call into mind the sounds of each season – icicles dripping outside my frosted bedroom window, the creaking of young trees waking up in spring, the thunder of summer storms, the crackling of leaves underfoot while running forest paths. Yet I yearned to travel. In pursuit of the last full solar eclipse of the millennium (perhaps just an excuse to time my trip), I left New York City for Mumbai in July 1999. Thinking I’d be gone for six months and then return to a life decision and career path in Manhattan (milliner, designer, actor or MBA? ), life had other plans and I spent the next nearly – seven years in the tropics. Initially I thought they had no seasons near the equatorial countries of India, Thailand, Barbados & Puerto Rico. But as the years rolled round I came to know the seasons differently—frangipani season, mango season, rainy season, dry season, hurricane/monsoon season. And they were cyclical there too. In 2005 I moved to New Zealand, strangely for me, Wellington has been the longest I’ve lived anywhere in my whole life. So now I’m blessed with exposure to the Southern Hemisphere seasons, though Wellington has its own particular personality when it comes to weather. Still, I find the cycle of the year is an egg, though what’s changed for me is not the months but the seasons. At the narrow top sits December and January, but this is now summer instead of winter. At the wider bottom is not the broad swell of summer’s heat and light, but the dark and cold of Wellington winter that is much of May through August. While spending some time by myself to re-group in late 2009, a map emerged for me with MYOGA. I had been teaching yoga for about nine years and had noticed patterns, cycles in my teaching. It made sense to utilize the heat of summer to go deeper and yet to use cooling practices to balance that work. It made sense to explore the wisdom of the dark and the upper chakras in winter when the weather is an externalization of our own human pulling-inwards. While Spring and Autumn are their own seasons, they are also redolent of hallways or transition zones where some things give way and others emerge. Thus was born the Seasonal Structure for MYOGA that gave me a framework upon which to drape all the practices I had explored and loved to share with students. I find it’s too much to squeeze every asana into a practice and forget about pranayama. Or to make mantra and sound a separate practice. I prefer to operate so that each season has all senses satisfied and each sadhana has all ashtanga limbs explored. What is overlaid on this cycle of the external weather is the energetic map of the internal human energy potentials -the chakra system. There is so much to learn in yoga and our ambitious western minds can get in the way of true integration by attempting to cram it all in. Along with seeing the calendar year as an egg, I’ve seen in my mind’s eye my own life as a spiral. This is not unusual in indigenous cultures. The koru is the Maori emblem of life’s circularity. The grouse is an animal symbol in the Americas since it’s known to move or dance in circles. What I find helpful about the spiral is that it enables me to pass over the same terrain again and again without feeling I’m spinning in circles. By visualizing that this time I pass over an ‘area of development’ I’m a little higher up or wider out, I’m able to see that my perspective has changed. Maybe the button or the memory is still there and being called forth by the season or the circumstances, but I have another whole cycle behind me of growth snf awareness to apply to it this time. I have shifted power from the scorpion to the eagle, as the sign of Scorpio has the potential to do. Both are tremendously sensitive to shifts in wind and both have the power to attack, yet it’s the eagle with its ability to soar above and choose from that wider perspective, from that greater vision, that brings us closer to spirit. With perspective we can move from defensive to offensive, from reactive to responsive, from ego/competitive/scarcity mind to unity/collaborative/abundance mind. As we roll through the seasons my intention is to share with you some of the broader perspectives from the Seasonal Structure & how MYOGA, freedom to unfold, unfolds & enfolds through the year. Melissa is what is called by Nichiren Buddhists a “fortune cookie,” a young child raised in the world of spirit, yoga, alternative wellness practices, healthy food & conscious living. This is fortunate now, but made her a bit of a freak ‘way back when!’ She’s been teaching yoga for more than a decade & in 2008 developed what has become MYOGA - freedom to unfold, its Seasonal Structure & the MYOGA Apprentice Programme (MAP). Autumn is my favourite season too, one of the hardest things about moving to Wellington was how green it is all year round. But then I looked closer, and sometime further (Waninui is all kinds of red and gold)- the colours are there now. Maybe I just learned to see it differently! So true isn’t it? What you see is how you see! I noticed this the other night when I took a photo of a friend–it didn’t come out at all the way I was seeing it because the camera was focused on something else entirely which changed the lighting & the whole feel of the image. Such a good reminder. Thanks for your thoughts! Beautifully written article, Melissa! I love the way you’ve conceptualized the seasons in both your yoga practice and your illustration. Best wishes from New York. Aw, thanks Alisa! That’s particularly potent & generous coming from a full-time illustrator/animator! Soak up a bit of pungent August on the hot pavements of Manhattan for me please! Hi Melissa, I love your internalised thinking on seasons and cycles ad that beautiful organic picture! 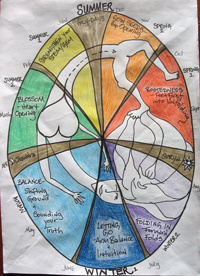 Our yoga ( Oki-do) is built around the seasons and moving into the elemental flow of each of these. Being Japanese there are 5 seasons honored and they make a beautiful rich tapestry of images that help guide the practice. I’d love to rave on further about it all with you at some stage . Here in Sydney it is the middle of winter and we are all engaged with the water element…the deep internal pull of the sap to centre, the inward flow and the way that our bodies, in particular the bladder and kidney system support that flow. Microcosm of the macrocosm is the way we build the practice. Thank you for your words. Hi Cate, I so look forward to learning more about Oki-do. Fascinating especially since one of the main “deities” of my ancestors is called Oki/Okee! I’m intrigued by Japan & have certainly been influenced by my exposure to Seido Karate & Nichiren Buddhism. Perhaps we can plan for you to lead an introduction to Oki-do here at Powa Centre next time you’re in Wellington. Or, next time I make it to Sydney, I can join some practices there! Thanks for your input & enthusiasm! Thanks for reading & I’m glad you gained value from both the words & the practice on the mat! Be well!